The LS2 Helmets Valiant features the most stable "modular to open face" conversion mechanism in the world. As much as 20% smaller than competitive models, the Valiant is lighter, more stable and more aerodynamic. Our lightweight, aerodynamic shell is made from LS2's proprietary Kinetic Polymer Alloy (KPA) - 2 shell sizes to allow for a perfect fit and the smallest shell possible. A full metal latch assures the chin bar will stay locked when closed, and an LS2 exclusive design keeps the chin bar securely in place at the back of the helmet when it is in the open position. The UV and scratch resistant shield is optically correct and uses LS2's Fog Fighter fog resistant treatment for the maximum in fog protection. The Valiant uses our Twin Shield System drop down sun shield. Its cable-operated switch is smooth, and easy to use even with a gloved hand. The removable, washable comfort padding uses breathable technical fabric, which is "Thermo-Formed." This eliminates the need for a layer of glue between the foam and the liner material, and allows for the ultimate in breathability. Our cheek pads use ultra-high quality foam that is cut to shape using LS2's 3D laser technology for all day comfort and no hot spots. Fully adjustable, flow through ventilation keeps you cool and more in control when the weather gets rough. 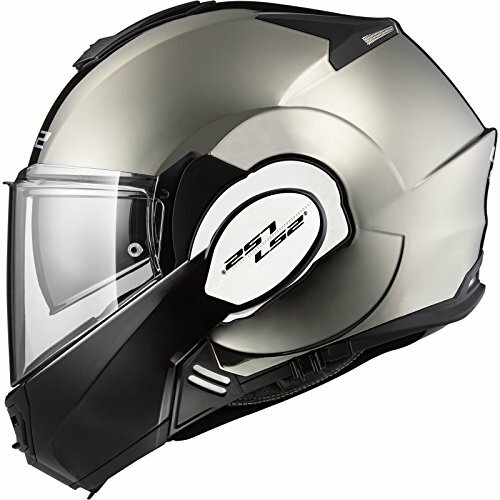 A DOT approved quick release chinstrap makes it a breeze to get the helmet off and on your head. Our designers at our world headquarters in Barcelona, Spain interviewed touring riders, adventure riders and commuters, and then set out to design the ultimate in a modular style motorcycle helmet. Built in our own factory for the best value on the market. More helmet for less cash. LS2. Long oval fit. Meets or exceeds DOT standards.